TEST B: For dogs which have not won a total of two First Prizes in Test B or won a First prize in Test C. Dogs must have qualified in Test A to enter Test B. To compete in Pre-Beginners a Dog must not have won a First Prize in any Class. 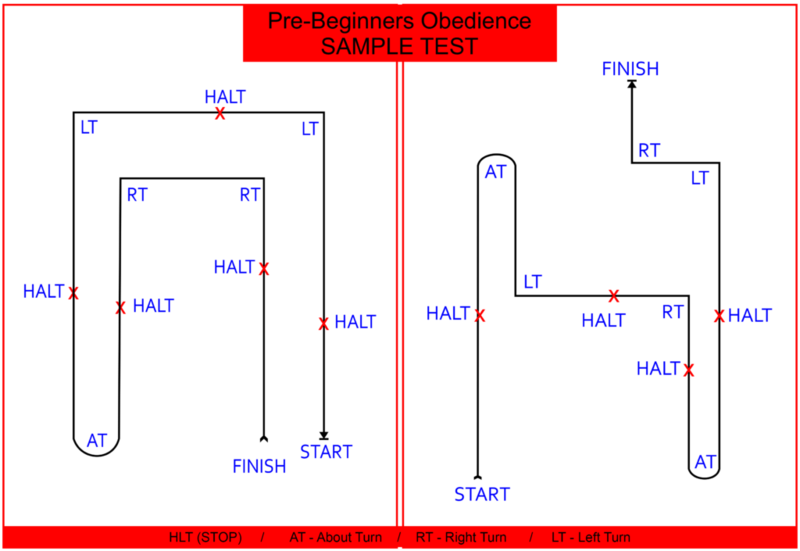 “last command” except in the SIT and DOWN tests. Recall from sit or down position at handler’s choice. Dog to be recalled by handler when stationary and facing the dog. Dog to return smartly to the handler, sit in front, go to heel – all on command of Judge or Steward to handler. Distance at discretion of Judge. Handlers will not be penalised for encouragement or extra commands except in the SIT and DOWN tests. In these tests, at the discretion of the Judge, handlers may face their dogs. Judge or Stewards must not use the words “last command” except in the SIT and DOWN tests. For dogs that have not won two first prizes in Test B or won a first prize in Test C. Dogs must have qualified in Test A to enter Test B. One command by word or signal except in the Send Away, Drop and Recall. Extra commands or signals must be penalised. One command by word or signal, except in Send Away, Drop and Recall where an extra command may be simultaneous command and signal. Extra commands or signals must be penalised.